Is there any more used, and abused, area of your home than the garage? Your garage is where you house everything from landscape equipment, like oil-leaking lawnmowers and caustic weed-killers-to rusty machinery and all those items considered too messy to be housed inside your home. Your family garage may serve as a roller-rink or skateboard venue in inclement weather. It’s where the grimiest tasks take place. Your garage may even be utilized as its intended purpose: a place to park the family vehicle. If your garage is as busy as most, you don’t have the time, talent or inclination to spend days treating and coating your floor. You surely want to take preventative measures against cracks and divots, which can go from bothersome to threatening in short order, but taking on a garage floor coating DIY project can be more than most homeowners bargained for, taking days to complete. Moreover, most garage floor coating products, sold for the do-it-yourself homeowner, are not as durable and long-lasting as those professionally applied. Many are little more than garage floor paint with enough plastic chips for minimal decoration. To request a no-obligation estimate for garage floor coating installation in Maryland, give us a call at (443) 519-2628 or contact us online! Prestige Floor Coating offers many different floor coating products for the home. Our specialized coatings can be professionally applied by our knowledgeable technicians to a variety of areas in and around your home including basements, outdoor walkways, concrete stairs and steps, patios, and garages, increasing the value and preventing dangerous slip-and-fall accidents. Our coatings are available in several colors and textures, making sure your floor coating is as aesthetically pleasing as it is protective, safe, and functional. To view our floor coating samples, click here. Many homeowners feel the original concrete flooring in their garage is sufficient for day-to-day use. Although incredibly strong, concrete has its breaking point. Hot and cold weather and constant use can cause cracks and crevices to form, deepening over time, and eventually ruining your concrete floor. Leaking automobiles and spills can leave your concrete floors stained and unappealing. When you have Prestige Floor Coating’s specialized formula applied to your garage floor, you’re protecting your concrete floor for years to come. Our garage floor coating is manufactured for concrete floors in the eastern US, using a formula created by our own team of chemists. What’s more, our technicians are skillful in the application of your floor coating, using state-of-the-art machinery and technique. When you trust your garage floor coating project to Prestige Floor Coating, you can rest easy knowing you’ve made the right choice. Not only is our product superior in its dependability, strength and good looks, but it’s safe for the environment. Specific formulas of polymers, epoxies, polyurethanes, and other ingredients provide 800 times the strength of standard concrete flooring. The rubberized membrane allows for weather-related shrinkage and expansion and you’ll never need to worry about peeling. Our technicians are professional, courteous, and time-concerned. Your project will be completed on time and with the utmost respect for your home and family. No job is complete until the homeowner is satisfied. 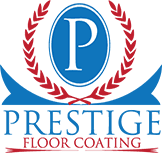 Prestige Floor Coating has been doing business in the Maryland and Washington, DC, areas for nearly two decades. We’ve covered more than 30 million square feet of flooring and proudly claim more than 40,000 satisfied customers. Contact us online or give us a call at (443) 519-2628 today to find out how to add protection and value to the most utilized room in your home with a completely free home estimate!